I'm in the process of changing some things up over here as I focus more on my music and put my books aside for a little bit. (Yes, d-VOR-ak fans, it will be back, but it will be a while.) In the midst of all of my construction, I've had something really interesting and fun happen to me that I want to share with you. 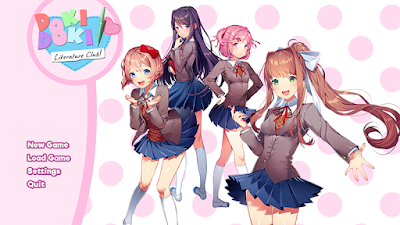 Doki Doki Literature Club is an amazing game that quite frankly I haven't made it all the way through, just because it is literally that messed up sometimes. Yeah, it looks like a super cute and fluffy dating sim, but that is literally just a buttercream layer that disguises the trouble underneath. This is NOT a game for the faint of heart or the easily scared, and most of my exposure of the game has been experiencing it in reverse, which in retrospect I'm glad I did. No spoilers, but if I had played this blind, I wouldn't love it nearly as much as I do. The ending theme song is a track entitled "Your Reality," in which side character Monika sings about her love for the main character (that's you!). I took the song, embraced the sound of Act 3's space oddities, and made my own version of the song that's now available on SoundCloud and, as of right now, BandCamp. We're working to get the song available in more places, it's just the logistics of having everything in the right place at the right time. As mentioned, the song is available on SoundCloud; if you hit the 'buy' link, you can download it on BandCamp as well! I'm still hard at work at making something that everybody will appreciate, and I'm glad that my fans have patience. Within the next month or so I'll be coming out with a few new tracks, and I will complete the move of this song to full promotion. Thank you for your support this far! I wanted to take a moment and write again on Remembrance Day. If you remember from my Odyssey of Light series, Remembrance Day -- for me, June 28th -- is a day to remember God’s provisions in all of our lives and how He can change things for the better, if we just trust Him to do so. And I’ve found it’s not just a God thing, too. Whatever branch of the universe you believe in, if you align yourself with karma’s correct path for you, your life will change and upend in ways you never thought possible. It’s such a mystifying and amazing occurrence that you have to be in awe of it, to remember it -- and that’s what Remembrance Day is all about. If you’ll remember correctly, that’s in a sense what the entire Odyssey of Light is about as well. On June 28th, 2005, I had no clue what my future held, I had a boyfriend for convenience, I was writing a novel, avoiding my ex-girlfriend, and was trying to find my way back to the God I knew existed. By August 16 -- Installation Day and the end of God’s journey with me -- I was ready for my senior year with a new drive and all distractions eliminated. I want to celebrate Remembrance Day with you all this year, my friends, my straphangers, as I witness God changing my life again and bringing me into a new era. What are some ways that God has changed your life for the better? What are some things that you can thank Him for? If you don’t believe in God, how have you noticed karma this year? What beautiful things have you seen in this world? Remember those, particularly now when all it seems we hear is bad news and trouble around every corner. Stop and think about the best day of your life, whether it was running down the midway at Cedar Point or relaxing under a tree in a field. I’d love to hear about some of the things you remember. And then, we take those memories, we hold onto that potential -- and for the next seven weeks, we do something about it. Let’s make this an Odyssey to remember. Over the last four parts, I’ve delved into my history and my past. Now, we reach the “so what” -- and how this affects me today. This is part 4 in a five-part series, in which I finally tell the truth about myself, my music, and my identity in Christ. For this entry in the series, I am building around a paper I wrote for my senior year English class (hey, I was told I could write about ANYTHING) which gives an account of August 16, 2005. Lots of you have read this version before, so I include it here, along with the proper rest of the story. Read the entire thing all the way through for the best experience. Also, this the longest entry, so buckle up, guys.